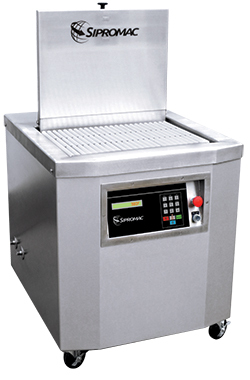 Using the shrink tank is extremely easy: simply place vacuum packaged product on the rack and push the button. Products packaged through shrink tanks have a cleaner appearance with less seams and folds in the shrinkable bags. Compact and affordable, shrink tanks are ideal for small and medium sized operations. Shrink tunnels are used for continuous production. All components have a smooth finish, accessible surfaces and are easily cleaned. Why use a heat shrink tunnel and dip tank? Click on the link below to see the advantages of using a heat shrink tunnel and dip tank in the food sector.